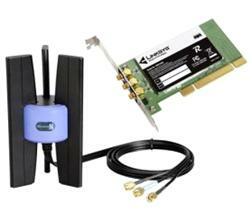 The Linksys Wireless-N PCI Adapter WMP300N uses the very latest wireless networking technology, Wireless-N (draft 802.11n). By overlaying the signals of multiple radios, Wireless-N's "Multiple In, Multiple Out" (MIMO) technology multiplies the effective data rate. Unlike ordinary wireless networking technologies that are confused by signal reflections, MIMO actually uses these reflections to increase the range and reduce "dead spots" in the wireless coverage area. The robust signal travels farther, maintaining wireless connections up to 4 times farther than standard Wireless-G.
With Wireless-N, the farther away you are, the more speed advantage you get. It works great with standard Wireless-G and -B equipment, but when both ends of the wireless link are Wireless-N, the throughput can be increased even more by using twice as much radio band, yielding speeds up to 12 times as fast as standard Wireless-G.
Once you're connected, you can surf the web, keep in touch with your e-mail, and share files and other resources such as printers and network storage with other computers on the network. To protect your data and privacy, your wireless connection is secured by up to 256-bit encryption. The included Setup Wizard will walk you through configuring the adapter to your network's settings, step by step. The incredible speed of Wireless-N makes it ideal for media-centric applications like streaming video, gaming, and Voice over IP telephony, and gives you plenty of headroom to run multiple media-intense data streams through the network at the same time, with no degradation in performance. So don't hassle with running cables through your house — get your desktop connected the easy way with the Linksys Wireless G PCI Adapter. Find out price and other info about this wireless adapter here. This draft N PCI adapter works great paired with the Linksys WRT300N draft Wireless-N router. I have three computers in my home all using WMP300N cards along with my WRT300N router. I also have a Vonage phone adapter hooked into my router (via Ethernet cable). No complaints at all. This product is speedy and appears to be low latency as well. It can easily handle the 4 Megabits/second download rate from my cable internet without any glitches or slowing down. If only more websites transmitted that fast! There is one caveat, however, I recommend that you do not install the Linksys software that comes on the CD. I found that it utilized quite a bit of CPU bandwidth just keeping the connection current. However, if you let Windows install the DRIVERS ONLY by searching the CD-ROM for the correct drivers, then it works perfectly and doesn't burn up any extra CPU cycles. With the Linksys driver software installed, I was seeing upwards of 30-50% CPU utilization even when not surfing the web. With the drivers installed via Windows XP hardware installation wizard, CPU utilization went down to practically zero whether surfing the web or not. Great product, especially for the price! Addendum regarding drivers - February 24, 2007 - The newest drivers do not cause the CPU utilization problems. I still don't think they are necessary, but at least they don't cause high CPU utilization problem. 9/13/2006: I plugged this into my computer and got the lockup that is widely reported on the Linksys tech support forum. I did my best to follow the suggestions: #1 Install the software before installing hardware. #2 disabling the linksys monitor software. #3 uninstall the software/driver and re-install just the driver. None of this worked. One other suggestion about disabling the power save feature I wasn't able to try because the computer would lock up before I could navigate that deep into the settings every time. The computer would lock up the instant the DNS address was aquired from my router (a Microsoft brand 54G router). Before aquiring a DNS address, I would see the link bounce rapidly between 25% and 100% quality, which is even worse than my old Microsoft 54G PCI card did. I promptly returned the card and the act of removing/reinstalling my old Microsoft card has boosted signal quality by just barely enough that I don't need the replacement anymore. Thanks Linksys, you just saved me $100. I had a horrible time getting it up and running, but once it was, it was solid as a rock and amazingly fast compared to what it replaced. We were running an old G router and PCI adapter that dropped the connection every five minutes and you had to wait a minute or two for it to reconnect, and while it was connected it was slow as mollasses. Very frustrating. We finally decided to upgrade to N. I got the Linksys WRT300N (which installed without a hitch) and this PCI adapter. It was a nightmare getting this adapter to talk to the router. We couldn't get the accompanying wizard to recognize the router at all. We talked to three tech support women over a period of 7 hours before the third got it up and running (after struggling with it for an hour) at the highest security level. I never thought they'd get it up, but the third was pretty sharp even though she was constantly surprised that this and that try of hers failed. Finally, she went back go ground zero in both the router and the adapter and then magically it started working! It is solid as a rock and has yet to drop the signal a single time. It has been constantly connected for about a week now. It is so fast compared to the G we had, it's like everything happens instantly! It even seems like it's faster than the computer that's connected directly to the router, but that computer has gobs more stuff installed on it and is used for C++ software development. Anyhow, good luck getting it running. Once that happens, you're fat city. Linksys Wireless N WMP300N is perfect for your desktop when you don't want wire running all over your house. It took me less than 3 minutes to get this installed and connected to my network. I don't understand why some people are having a hard time installing on Vista. I installed on a 64 bit edition without any problems. NOTE - VISTA OWNERS: DO NOT INSTALL LINKSYS CD. -Don't follow the directions on the paper, it's for XP -Make sure computer is off, and plug the card into your MOBO. -Connect the Antenna -Turn on the computer, Vista will automatically install the driver. -When you do a MS Vista update, you will have the option to update the driver. -Connect to your wireless router. If you run your computer for a few hours you will get the Windows Blue scree of death (A serious hardware error) This is a known issue with this and a few other Linksys adapters. They haven't done a good job here with the driver software. Do search on BSOD and WMP300N to see all the posts. Return to top of "Linksys Wireless-N PCI Adapter WMP300N"! !